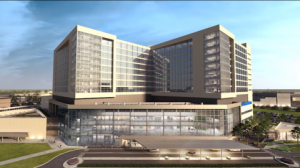 Featuring 12 floors and 460 beds, the new $800 million dollar hospital at the University of Texas (UT) Southwestern Medical Center was inaugurated last Thursday in a dedication ceremony. The William P. Clements Jr. University Hospital is a patient-centered, state-of-the-art medical innovation serving Dallas and the North Texas region, and it will replace the 50 year-old St. Paul University Hospital. The opening of the hospital, which is located at 6201 Harry Hines Blvd. in Dallas, is planned for December 6. The facility will offer patients 40 emergency treatment rooms, 24 surgical suites, 12 procedure rooms, 72 adult ICU rooms, and 16 labor and delivery rooms across its 1.3 million square feet of hospital space. In addition, it also includes 30 neonatal ICU rooms and 3 obstetric specialty surgical suites. “Planning and building the hospital has been under way for the past five years,” explained Podolsky. “So dedicating this extraordinary new facility today is an exciting milestone for UT Southwestern,” added the physicians, who also holds the Philip O’Bryan Montgomery, Jr., M.D. Distinguished Presidential Chair in Academic Administration. The ceremony gathered about 200 guests together, including government and community leaders, caregivers who will work at the new facility, UT Southwestern supporters, and contributors to Clements University Hospital. Dallas Mayor Mike Rawlings said he believed the facility is a “centerpiece for medical innovation” in a fast growing time. “North Texas is one of the fastest growing regions. This facility will meet a growing and important need for Dallas’ expanding population and the increasing demand for quality health care. It will help ensure that we remain at the forefront of the most advanced medical breakthroughs and patient care in the country,” the Mayor stated. UT Southwestern named the facility after the former Texas Governor William P. Clements Jr., a supporter of the university who granted the facility $100 million in 2009, making it the largest donation by a single contributor. Giving the hospital planners unrestricted use of the funds, the one requirement made by the Governor regarding the funds was that they were invested with a transformational purpose. “Our family is pleased that my father’s name will be associated with UT Southwestern in a hospital that will foster the spirit of discovery and the pursuit of excellence that he embodied throughout his life. We are very grateful for this honor,” stated Governor Clements’ daughter, Nancy Seay. Along with other donations, the funds were crucial in the construction of the Building the Future of Medicine campaign, which raised more than $200 million. The Clements University Hospital is focused on a “big idea” behind its design, which means that the entire facility was planned and built with patient care and experience in mind. “That’s our commitment, and it guided every decision we made,” explained Podolsky. Physicians, nurses, hospital staff, patients, and community friends of UT Southwestern were part of the design process, based on a unique level of collaboration and community planning. “This means that our patients will have access to the best care and most advanced treatments, including access to clinical trials that are exploring new therapies for their conditions,” added Warner, who holds the Jim and Norma Smith Distinguished Chair for Interventional Cardiology and the Audre and Bernard Rapoport Chair in Cardiovascular Research. The Executive Vice President for Health System Affairs, Bruce Meyer, M.D., specified that the hospital will “treat the whole person, not just the illness.” “Every element of the hospital was designed with the patient’s comfort and recovery in mind,” he explained, referring to features of the facility that include spacious individual rooms with large windows and abundant natural light as a way of improving healing and well-being. The facility also aims to improve the relationship between nurses and patients as “patients like having their nurses close by, and nurses thrive when they can develop relationships with patients at the point-of-care,” said Dr. Warner. In addition, it will also offer videoconferencing technology in all patient rooms, in order to allow caregivers to consult with other members of the patient’s care team, or show X-rays, CT scans, or MRIs to patients. Patients may also use this technology to interact with their families and friends. Research and learning will be an important feature of the new Clements University Hospital, and more than 35,000 square feet of its facility will be dedicated to it. In each floor dedicated to patient care, there will be also a space for clinical research, not only for physicians to conduct studies, but also for patients to undergo cutting-edge therapies. In addition, the Hospital will also comprise a 10,000-square-foot Education and Conference Center, designed to provide breakthrough facilities for conferences, symposiums, and demonstrations, as well as support for UT Southwestern’s continuing medical education programs, medical conferencing, and lectures for medical students and residents. Thinking of patients and their loved ones, the Hospital will also have an interactive, professionally staffed Patient and Family Resource Center to offer information and understanding on diseases’ causes, therapies, and cures. The Clements University Hospital’s focus on innovation is pronounced, having been built entirely with private funding, as explained by the UT Chancellor, Francisco Gonzalez Cigarroa, M.D. Even though UT Southwestern is a state institution, the construction of the new hospital did not use state funds. On contrary, it collected donations, funds from the sale of bonds, and revenues from its physicians. “Supporters believed in the vision for this new hospital, and they invested in it,” Cigarroa said. “As a result, a magnificent new facility joins UT System’s health institutions, serving not only patients, but developing the best and brightest medical students, residents, and fellows, who will become the caregivers of the future.